James the Just, also called the brother of Jesus, plays an important role in the Gospel of the Hebrews. The Gospel of the Hebrews is a lost Jewish Christian gospel known today only in several fragments and references in the writings of the Church Fathers. Its date and authorship are uncertain, although it is not more recent than the mid-second century. Some patristic writers refer to it as a Judaized version of the Gospel of Matthew, although none of the excerpts they provide shows a relationship the Matthew's work. This Gospel of the Hebrews may have been used in Jewish Christian congregations as early as the first century CE. The early church historian Hegesippus (died 180) used this gospel, and several of the Church Fathers quoted from it. Saint Jerome (early fifth century) was particularly interested in the work and reported that he translated it from Syriac into both Greek and Latin. As late as the ninth century, Patriarch Nicephorus of Jerusalem listed the Gospel of the Hebrews as a disputed scripture, along with the Book of Revelation. Because several writings seem to have been known by the title Gospel of the Hebrews, it is difficult to be certain which of them is being referred to or quoted from in various references of the Church Fathers. The general view is that the work was closely related to the Gospel of Matthew and eventually faded from circulation. Another possibility is that it was considered heretical—either as a Gnostic or Judaizing text—and actively suppressed. Among the work's more interesting teachings are the femininity of the Holy Spirit, a mysterious connection between Jesus' mother Mary and the Archangel Michael, and the special role of James the Just, rather than Peter, immediately after the Resurrection of Jesus. When Christ wished to come upon the earth to men, the good Father summoned a mighty power in heaven, which was called Michael, and entrusted Christ to its care. 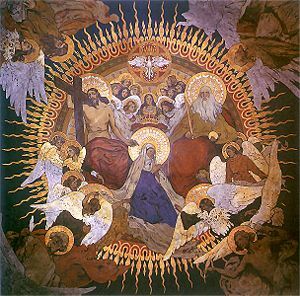 And the power came into the world and it was called Mary, and Christ was in her womb seven months (Cyril of Jerusalem, Discourse on Mary Theotokos 12a). The Gospel of the Hebrews refers to the Holy Spirit as feminine, being Jesus' "mother." Even so did my mother, the Holy Spirit, take me by one of my hairs and carry me away on to the great mountain Tabor (Origen, Commentary on John 2.12.87). And it came to pass when the Lord was come up out of the water, the whole fount of the Holy Spirit descended upon him and rested on him and said to him: "My son, in all the prophets was I waiting for you that you should come and I might rest in you. For you are my rest; you are my first begotten son, who reigns forever" (Jerome, Commentary on Isaiah 4). He that marvels shall reign, and he that has reigned shall rest (Clement of Alexandria, Stromateis 2.9.45.5). "…He that seeks will not rest until he finds; and he that has found shall marvel; and he that has marveled shall reign; and he that has reigned shall rest" (Ibid., 5.14.96.3). Never be joyful, except when you behold your brother with love (Jerome, Commentary on Ephesians 3). ...He that has grieved the spirit of his brother [is guilty of a grievous offense] (op. cit., Commentary on Ezekiel 6). The Lord… went to James and appeared to him, for James had sworn that he would not eat bread from that hour in which he had drunk the cup of the Lord until he should see him risen from among them that sleep. And shortly thereafter the Lord said: "Bring a table and bread!" …He took the bread, blessed it and broke it, and gave it to James the Just, and said to him: "My brother, eat your bread, for the son of man is risen from among them that sleep" (op. cit., De viris inlustribus 2). Because the gospels used by the groups known as the Nazoreans and Ebionites are also sometimes called the "Gospel of the Hebrews," some commentators include passages from Epiphanius of Salamis (d. 403) as belonging to the Gospel of the Hebrews. For our purposes, these will be considered as relating to the Gospel of the Ebionites or that of the Nazoreans. One of the unique features of the text is its reference to the Holy Spirit as being Jesus' mother. Some commentators believe that this reference stems from that the word "spirit" in Hebrew is of the feminine gender. In addition, the Shekinah (the "presence" of God as in the cloud which descended upon the Tabernacle in the time of Moses) is a feminine word, thought to be Yahweh's feminine aspect. On the other hand, some have suggested that this passage may constitute an identification of the Virgin Mary as an incarnation of the Holy Spirit. 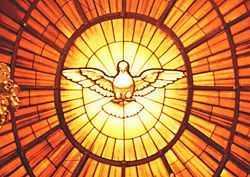 Another possibility is that the passage reflects a Gnostic tradition of the femininity of the Holy Spirit. Another interesting aspect of the Gospel of the Hebrews is that it puts a particular emphasis on the appearance of Jesus to James the Just, possibly pointing to him as the head of the Jerusalem church. The Stichometry of Patriarch Nicephorus of Jerusalem in the ninth century states that the Gospel of the Hebrews is 2200 lines, 300 lines shorter than the canonical version of Matthew. Nicephorus lists three categories of scriptures: the canonical writings, the recognized apocrypha, and the antilegomena—disputed works. He incluldes the Book of Revelation among the latter category, along with the Apocalypse of Peter, the Epistle of Barnabas, and this Gospel of the Hebrews. Some scholars agree with the Church Fathers who hold the canonical Matthew to be the original and the Gospel of the Hebrews to be an embellishment or abridgment of it. However, Jerome's report that he translated the work into both Greek and Latin is cited as evidence for this gospel's being substantially different from Matthew's gospel. The name Gospel of the Hebrews appears to have also been a generic term for Jewish-Christian gospels, which has led to some confusion among such titles as the Gospel of the Nazoraeans, the Gospel of the Ebionites, the Gospel according to the Hebrews, and the lost Gospel of Matthew in Aramaic. Epiphanius of Salamis records in his Panarion: "And they [the Ebionites] receive the Gospel according to Matthew… (which they) use to the exclusion of others. And they call it according to the Hebrews… (However, it) is not whole and complete but forged and mutilated." This work may or may not be the Gospel of the Hebrews dealt with here. In the fragmentary states of these apparently various gospels, it is difficult to establish clearly their identities, derivations, or connections, except as noted in passing by mainstream patristic writers. Orthodox Christian writers labeled these gospels and often characterized them by those who read them, while assigning specific apostolic authors—either apostles or companions of apostles—to gospels considered to be orthodox. None of the canonical gospels actually identifies its author in the earliest manuscripts. Saint Jerome took a special interest in the Gospel of the Hebrews. 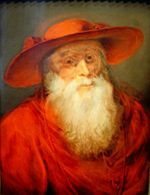 (painting by Rubens (1625-1630). As indicated above, a number of mainstream Christian writers knew this text, some without mentioning it by name. Origen and Eusebius cite it three times each, and Saint Jerome deals with it no less than 19 times. 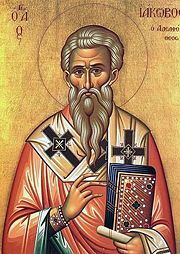 Clement of Alexandria and Cyril of Jerusalem also quoted from it, and Eusebius mentions (Historia Ecclesiastica, IV.xxii.8) that the it was known to the earlier church historian Hegesippus. Jerome identifies the writer and readers of this gospel as observant Jewish Christians who used the Hebrew version of the Jewish scriptures, as distinct from Hellenized Jewish Christians who used the Greek Septuagint version. Jerome took a serious interest in this book. More than once he mentions that he made translations of it into Greek and Latin. For some, this argues for the work being substantially different from the canonical Gospel of Matthew. However, as with Ephiphanius' writing, it is not always clear whether Jerome refers to the Gospel of the Hebrews, or that of the Ebionites or Nazoreans. Most commentators conclude that the text was similar enough to the canonical forms of Matthew that it was considered basically orthodox. However, because it was effectively redundant, it eventually passed out of use. However, its reference to the femininity of the Holy Spirit and its mysterious description of a special relationship between Mary and the Archangel Michael hint at possibly heretical Gnostic ideas that might cause the gospel to be suppressed. The Ebionites, with which it may also have been associated, were indeed considered heretical as a Judaizing sect, though not as a Gnostic group. Bütz, Jeffrey J. The Brother of Jesus and the Lost Teachings of Christianity. Rochester, Vt: Inner Traditions, 2005. ISBN 9781594770432. Cameron, Ron. The Other Gospels: Non-Canonical Gospel Texts. Philadelphia: Westminster Press, 1982. ISBN 9780664244286. Ehrman, Bart D. Lost Scriptures: Books That Did Not Make It into the New Testament. New York: Oxford University Press, 2003. ISBN 9780195182507. Levine, Amy-Jill, and Marianne Blickenstaff. A Feminist Companion to the New Testament Apocrypha. Pilgrim Press, 2004. ISBN 978-0829816082. Early Christian Writings: Gospel of the Hebrews: Translations of the fragments and introductory material www.earlychristianwritings.com. History of "Gospel of the Hebrews"
This page was last modified on 27 June 2017, at 16:15.